This week’s edition is now available in shops and online, here. This week our front page story sees campaigners, who spoke out against plans for two major onshore wind farms, say they will continue their fight following confirmation that the developer, Hoolan Energy, has submitted appeals to the Scottish Government, seeking overturn the local council’s decision to refuse. This week’s paper also features plenty of coverage from the 2018 Orkney Food and Drink Awards. A petition, appealing for speeding control measures to be put in place at Kirkwall’s Watersfield housing development, gathers support. A local wartime historian is presented with the British Empire Medal. The sinking of HMS Royal Oak, 79 years ago, is remembered. A local ram sale record price is broken not once but twice. 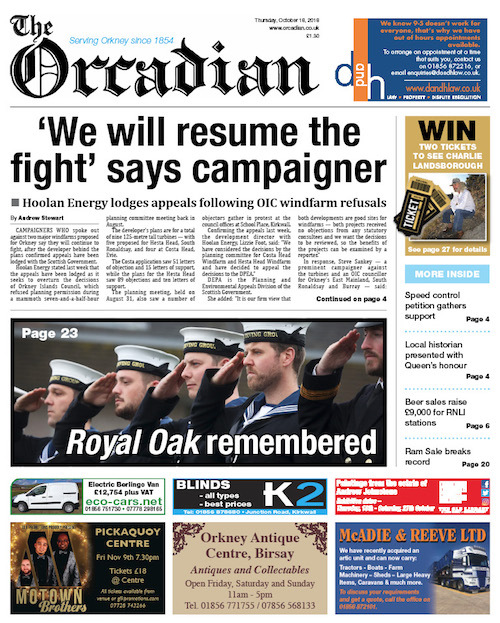 For all these stories and much more, pick up a copy of this week’s edition of The Orcadian.